Zyuranger 21 with Mega Anon!! Thread: Zyuranger 21 with Mega Anon!! Dragon Caesar! What more do I need to say? When I first saw Zyuranger I was blown away when I watched this. It’s got everything I love in a Toku. Great effects, a giant monster, lot’s of destruction, and tons of shots of civilians running in fear. It’s definitly something that Sentai doesn’t always do and when they do it’s just awesome.I wish they’d do it more because it is a treat for the eyes. 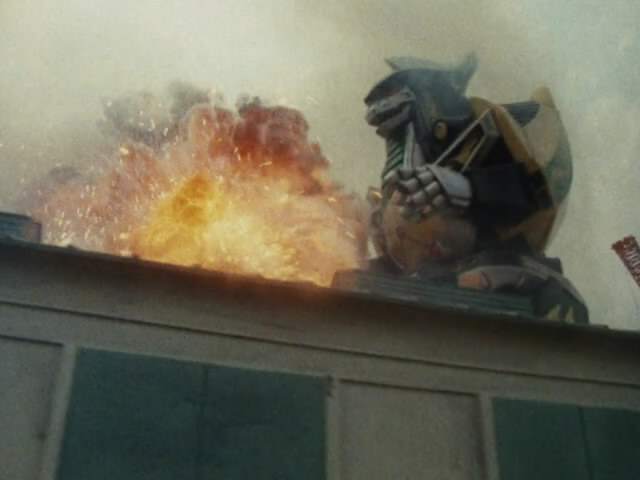 The latter half of this episode feels exactly like a Godzilla film. It’s no surprise that people draw so many parallels between Caesar and Godzilla/Mecha Godzilla. You almost expect Godzilla himself to show up and take down Caesar before turning his attention onto Tokyo. It’s just such a great episode and it’s one of the episodes that stuck with me long after I watched it. Coincidentally the two episodes I feel that strongly about both involve Caesar. He’s one of my favorite characters in this show, but you won’t get to see why for a while. Enjoy the first half of Caesar’s rampage. We’ll be back next week with another historic episode. Last edited by virushopper; 07-26-2014 at 04:49 AM.